Gayla and the girls are out of town, that leaves Pete and I at home to to fend for ourselves. This means the meals may be a little different. 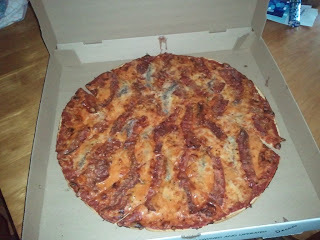 Tonight was a Bacon and Anchovy pizza from Imo's or as the girls call it Fish Pizza. This is the picture of the day.